As you know, we three kitties are not the most cuddly bunch. This is how we hang out on the bed together when the humans aren’t around taking up so much room. Eventually somebody (almost always Binga) decides it is smackdown time. 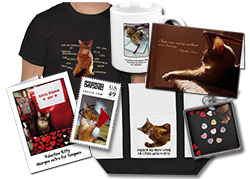 But for today we are joining paws and purring for peace, along with so many others in the blogosphere! Thanks for today’s Blog Blast for Peace, Mimi! Click here to see my peace post for last year, and here for my 2009 peace post! Awesome peace globe and post. I just loved it. Thank you for blogging peace with us! The thee paws say to me “All for peace and peace for all!” (very muskateerish 🙂 ) and that’s a real nice sentiment! Great image! We are purring for peace. Oh kitties, that is awesome! And we love your peace globe, it is beautiful! We love your peace graphic with your paws joined! We’re purring for peace on the bed and in the world for all beings! United we furries stand today, and every day, for world peace. Oh if only the humans could get it together. Peace to you and your family. A little skirmish between cats is okay from time to time, but peace is even better. What a great peace globe! I wish you peace, my friends. How cute to see you all join paws for peace. What a great idea. Well, if the three of YOU can make peace with each other, that gives me lots of hope. We’re impurressed to see you holding paws! We purr with you fur peace! Wishing you peace always dear friends! Mowzers – you guys all held PAWS! Momma’d have a hard time getting Allie to hold paws wif FaRADaY… we’re all REEEALLY impressed! It’s for a very good cause though. 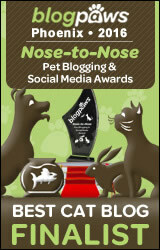 Blogging for peace is a pawesome event to support. Wow, we love your Peace Globe with all of your paws together! China Cat & I are so glad to be purring today with you! We love your peace globe!! Absolutely amazing graphic. peace to you all! I love your peace globe with all the kitty paws together. Peace to you today and every day. I bet the smackdowns are more play than serious. Peace too all of you too! You can try to be peaceful..that is al lwe can do! Sparkle…. we love your peace post. Very nice. Dona Nobis Pacem to yous guys! We’re purring for peace over here too friends. Love the graphic – and the bed picture made mom laugh!! We really like your peace globe, Sparkle. We thought about trying to do something with that one, but our mom’s hopeless with graphics, as you know. We just love the peace and paw graphic. It’s the best picture we’ve seen for peace day. That is very beautiful, Sparkle. We are all in this together! We love your peace globe!! And we hope you all find a little peace today!! It’s so good to see you all together, maybe not cuddly, but peaceful. Great graphic, too, Sparkle! Wow, love that picture and the paws together. Also like the way you turned it orange. Hope you have a very peaceful day. Great post. That is a most excellent graphic! Awww, we LOVE the paw touches! That is SO much peace.